Before we get into the Samson Meteorite USB microphone review, grab a snack, sit back and relax because.. Maximum SPL: 120 dB. What is SPL? I was a bit disappointed in the sound coming out of the Samson Meteorite USB condenser microphone. The difference between a USB microphone and an XLR microphone. It wasn’t that the sound was bad per se, just not up to par with the Samson Go mic (similar price range). I tried a few times to get a decent recording, and what you’ll hear below is about as good as it got. The mic is a little smaller than a golf ball, and comes with a nifty magnetic holder which I did enjoy quite a lot. Many do complain about the chord, as it’s very short and does not disconnect from the ball of the mic. Build quality is decent, nothing spectacular. The base holder feels solid but the mic itself is a bit light for my tastes. Doesn’t come with a carrying case or pouch. Cable is quite short and not removable. Sound is not on par with some of Samsons other offerings in this price range. The sound is very tinny, hollow, and a bit sibilant. What does sibilant mean? There’s no meat or power behind the words. Sadly, not many people. I suppose it would make an okay mic as a backup in a pinch. I would really only use it for voice type recordings. I just was not impressed with the sound quality. Since it’s plug and play USB, nothing. But I would definitely employ a pop filter if you’re going to purchase this one. However, even with the pop filter I wasn’t too thrilled about the sound. It may take awhile for your CPU to recognize it. For mine it took between 1-2 minutes. This didn’t give me a whole lot of confidence going forward. This has been common with Samsons lower budget options (Go mic, Meteor, Meteorite). If it’s not recognized, do a hard reboot and it should be okay. A “Meteo-cre” sounding mic (lol) with a decent build. May or may not be recognized by your computer. I would definitely recommend the Samson Meteor over the Meteorite. The Meteor delivers pretty exceptional sound quality for only a little bit more dough. Both do pick up quite a bit of background noise, but Acoustic Sound Treatment never hurt anyone. Interested in learning more about the Samson Meteor? CLICK HERE TO READ MY SAMSON METEOR MIC REVIEW!! An array of colors. Comes in Blackout, Platinum , Silver, Space Grey, White-out, Vintage White, and Midnight Blue! Well that’s about it for today my friend! 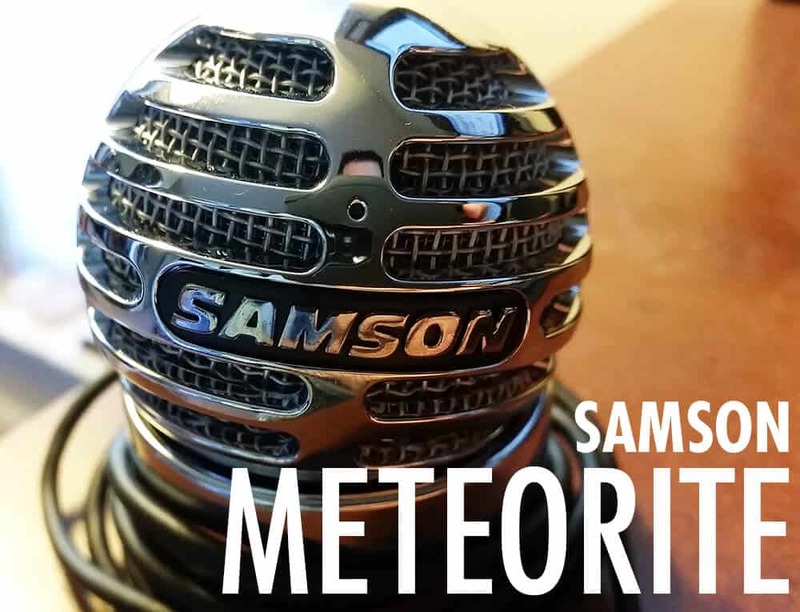 I hope you’ve enjoyed this Samson Meteorite USB microphone review. Would you be more inclined to purchase the Meteor or Yeti? I would love to hear from you. Until next time..